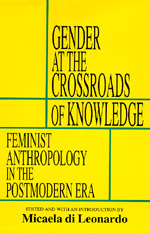 Gender at the Crossroads of Knowledge brings feminist anthropology up to date, highlighting the theoretical sophistication that characterizes recent research. Twelve essays by outstanding scholars, written with the volume's concerns specifically in mind, range across the broadest anthropological terrain, assessing and contributing to feminist work on biological anthropology, primate studies, global economy, new reproductive technologies, ethno-linguistics, race and gender, and more. The editor's introduction not only sets two decades of feminist anthropological work in the multiple contexts of changes in anthropological theory and practice, political and economic developments, and larger intellectual shifts, but also lays out the central insights feminist anthropology has to offer us in the postmodern era. The profound issues raised by the authors resonate with the basic interests of any discipline concerned with gender, that is, all of the social sciences and humanities. Micaela di Leonardo is Professor of Anthropology, Gender Studies, and Performance Studies at Northwestern University. She is the author of The Varieties of Ethnic Experience: Kinship, Class, and Gender in Northern California and Exotics at Home: Anthropologies, Others, American Modernity and the coeditor ofThe Gender/Sexuality Reader. Margaret Conkey, Susan Gal, Jane Guyer, Micaela di Leonardo, Nadine Peacock, Elizabeth Povinelli, Rayna Rapp, Harold Scheffler, Irene Silverblatt, Susan Sperling, Ann Stoler, Kay Warren, Patricia Zavella.